Property is SOLD. 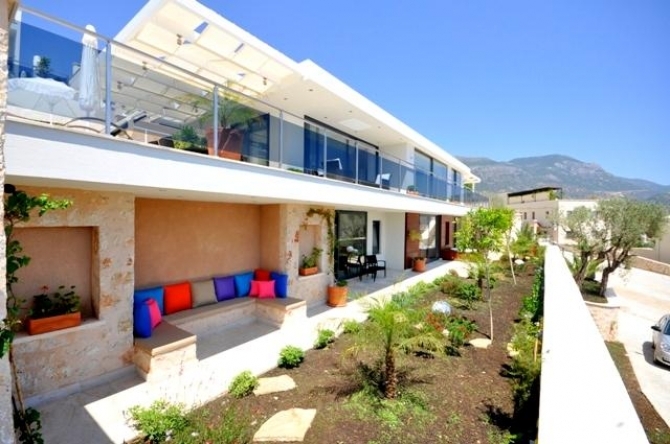 An outstanding property, high quality, panoramic villa for sale overlooking Kalamar bay, Kalkan with unique contemporary design and private infinity pool. The property benefits from a covered car garage on 500sqm private plot, detached on its own grounds. Located only 500 metres to Kalamar seafront and within easy reach of Kalkan town centre, this contemporary modern property offers breathtaking views and a spacious pool deck to enjoy it. The access level (ground floor) consists of a spacious panoramic living room and an en-suite double bedroom. The living room opens to the infinity pool area with plenty of external space around the pool. Kitchen is open-plan and connects to the dining room. Lower ground floor consists of 3 double bedrooms, all with en-suite bathrooms and all sea-facing. The lower ground floor opens to the lower garden as well as having external stairs to the pool area. The villa has a covered car garage. The villa is designed in a rectangular shape with wide side toward the sea ensuring views from all rooms. The design is contemporary and quality is exceptionally high. The villa is part of a small cluster of 3 detached and 2 semi-detached villas. This particular property sits separate from the 4 villas at the back and has its own independent grounds. The villa is located on the Kalamar side of Kalkan with superb views over the islands and within short walk to Kalamar seafront. Kalkan harbour is some 15 minute to walk.